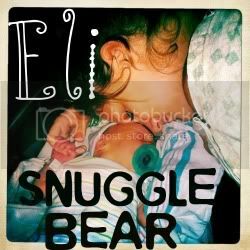 Snuggle Bear Eli: The little things count the most. i think it's awesome that you want to get out there and get your blog noticed. and it can be hard when there are thousands of other mommy bloggers out there. i think the best way to do that is to visit other blogs and comment, comment, comment. it might sound tedious at first, but a lot of blogging is just networking. and once you get in, you're in. engage someone with your comment. say something witty, or ask them a question, and hopefully they will come back to your blog to answer that question. and then they'll see what you're all about. from experience with tbb, no one is really going to find you unless you're on the first page. it's kind of just a big waste of time.